Also known as the Galaxy J7 Refine under Sprint, though we are quite reluctant to call it that, since its 2017 predecessor offers a higher-tier selection of pros and cons, the Samsung Galaxy J7 2018 aims for a more budget-cautious clientele. Just like the J7 2017, this 2018 sequel runs on a middle-class 1.6GHz octa-core processor that shies of the engines powering the best octa-core smartphones available. However, given its other cons, the aforementioned chip seems like a fitting choice. 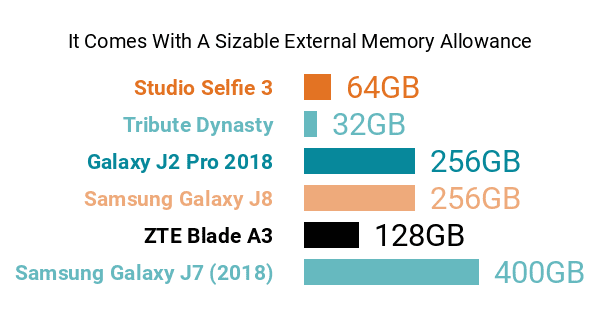 Sadly, the J7 2018 drops from its predecessor's respectable 3GB RAM count down to only 2GB , which, as of this technical review, was considered a modest entry-level facet. Its not-so-refined specs also include a 5.5-inch screen that we consider a drawback for two reasons. First, it sticks to an HD-720p-only definition , which we here at Phonerated are allergic to, particularly when it comes from a phone with at least 5.5 inches of screen space. 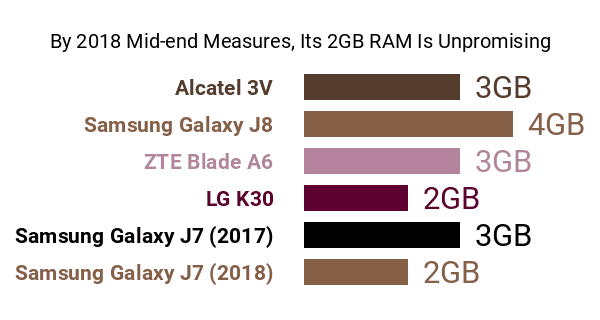 Second, it comes with a rather cheap TFT architecture , whereas a good number of other 2018-released Samsung Androids (Get to know the best Samsung phones here) use the more-advanced AMOLED technology. Jumping over to its pros, the Galaxy J7 2018 features a 13-megapixel f/1.9 selfie camera whose raw pixel resolution gives it an edge versus other mid-end contenders on the selfie front, seeing that many of its contemporaries stick to mundane 8-megapixel selfie cams only -- discover the best phones for selfies here. It also carries the phone's facial recognition system for user authentication. At the back, the J7 2018 features a tolerable 13-megapixel f/1.7 primary camera with standard flash and autofocus. Also on board is Samsung's Bixby mobile assistant , with features like the Bixby Vision image-searching and shopping algorithm and the Bixby Home quick information dashboard tagging along. A couple more of its selling points include a 32GB internal storage memory (A 16GB version is offered as well) and a 400GB maximum external memory allowance , both of which are higher than the 2017 version's 16GB maximum on-board storage and 256GB external memory limit correspondingly. Its pros and cons are powered by a 3300mAh battery that scores a reassuring 20-hour video playback time (1200 minutes) . This 2018 Galaxy J model runs on the Android 8.0 Oreo, which tops it off as a reasonable purchase for shoppers looking for a mid-level phone with an above-average selfie camera.